Fifty people have been sentenced for their part in violence that broke out during an English Defence League protest in 2013. 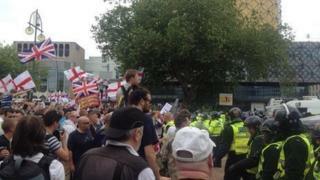 About 2,000 EDL supporters massed in Centenary Square on 20 July, where missiles and bottles were thrown at police. One officer was injured. On Friday, the final cases concluded at Birmingham Crown Court. The sentences have ranged from community orders to jail terms of more than three years. Det Ch Insp Simon Wallis, from West Midlands Police, said it sent a "clear warning" to anyone planning to protest in Birmingham "to behave". "CCTV showed some of those had no interest in the speeches going on and engaged in wanton violence, throwing bricks, hurling anything they could find at the police, members of the public, causing damage," he said. Many came forward after CCTV footage was broadcast on BBC One's Crimewatch programme last year, police said. Sentencing started on 11 December, with defendants appearing before Birmingham Crown Court in groups. Det Sgt Harjit Ubhi, who led the year-long investigation, said Friday's sentences marked the end of a major operation involving many hours of CCTV, mobile phone and police camera footage.